Sweet but spiked with a bit of warm spice, these peach preserved will take your toast and biscuits to the next level! I think I might be a bit jam, preserve and spread obsessed lately! This is actually my third peach jam version on the blog so far and that doesn't include the vanilla peach sauce! Who would have thought? 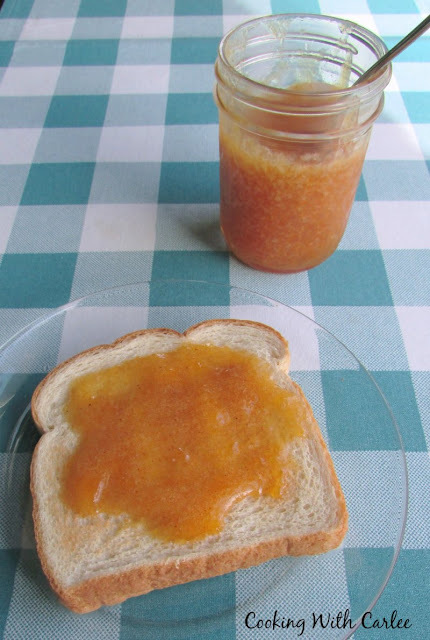 I love making peach jam, it is so easy. All it takes is a little bit of acid and the natural pectin already in the peaches. You just need to give it enough time to do it's magic. You can go from fresh or frozen peaches to jam in less than a half hour. I wanted to make Kristie's shower extra special, so there needed to be homemade jams for the biscuits. I made some blackberry spread from our homegrown berries, but Kristie isn't usually into things with berries. So, I thought I would make some peach preserves too. But being fall and all, I wanted to warm up the tones a bit. So a little cinnamon, ginger and nutmeg later and warm slightly spiced peach preserve was born! It was delicious and fun and easy and perfect. Combine peaches, lemon juice, sugar, ginger, cinnamon and nutmeg in a large heavy bottomed sauce pan. Cook over medium low heat, stirring frequently. Bring to a low boil and continue cooking and stirring for about 15 minutes. For chunky preserves, mash with a potato masher or blend with an immersion blender for smoother preserves. Put a small drop of preserves on a plate and refrigerate for a minute to check your consistency. If it is thick enough for you, remove from the heat. If you would like for it to thicken up a bit, allow to simmer for a couple more minutes and then try again. Once you have the desired consistency, remove from heat and stir in vanilla. I know I only have 2 thumbs but this one gets 3 thumbs up! You are speaking my peach love language girl! I love the little cinnamon and nutmeg to spice up the peaches! This looks like my kind of spread. This might be cute to package up for gifts that's so many people I love adore peaches! you just gave me an idea! I hope your weekend is spectacular my friend! What a great idea! I always love food gifts too. Thanks, Andrea! I love spiced peaches. 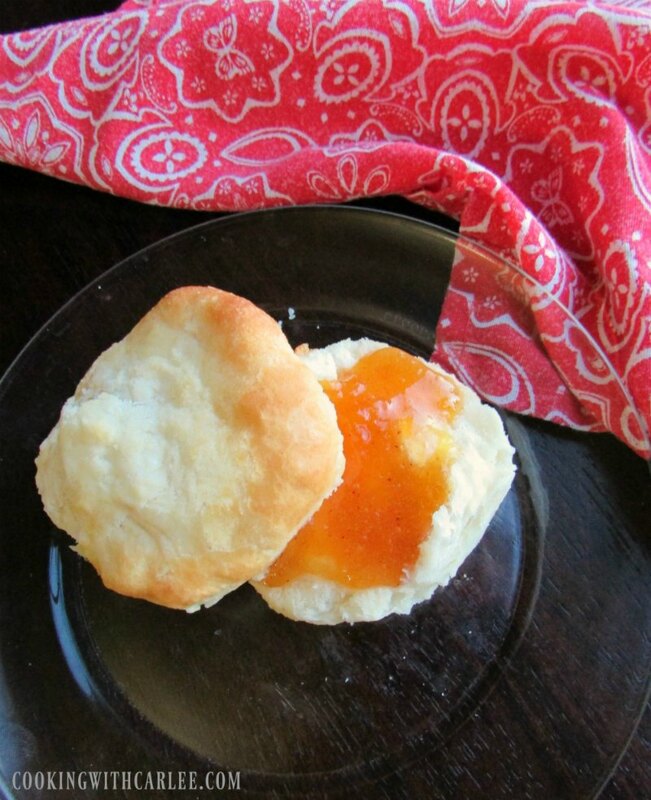 This would be so good and that biscuit is the perfect conductor of this to my mouth. Thanks for sharing. It really was perfect on biscuits! Thank you, Linda! I love this recipe for spice peach preserves Carlee! Thanks for sharing it and I'd love to make it sometime. Thanks, Julie! I hope you have a fabulous Thanksgiving as well! I would like to order 6 jars for next week please! Love the addition of ginger...can't wait to try it! No problem, I'll get them delivered ;-) Thanks! Oh, yum! Everything about this preserve recipe looks perfect. I can't wait to try it! Pinned and sharing. Thanks for joining us at Family Joy Blog Link-Up Party! Thank you! We have been having some on our toast every morning! I had all my frozen peaches set aside for winter smoothies, but I may just have to steal some away to make this. Sounds delicious! You won't be disappointed! ;-) Though now a peach smoothie sounds soooo good! Weren't they? I love traditional peach jam and preserves, but I have been having a lot of fun playing with the flavors lately too. I figured I love spiced peaches so much, why not do spiced peach preserves? !